This sounded like fun so I thought I would give it a try. 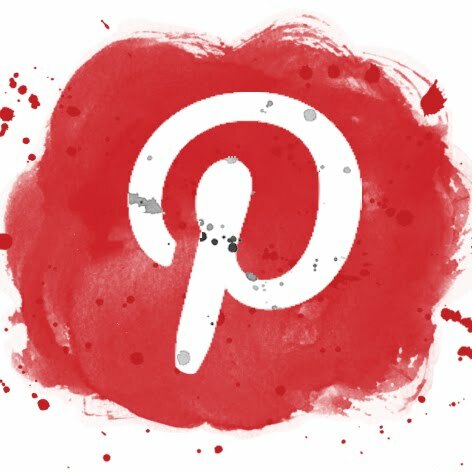 The Etsy Homefront Artistry Team hosts a Blog Social every 2 and 4/5 Monday. 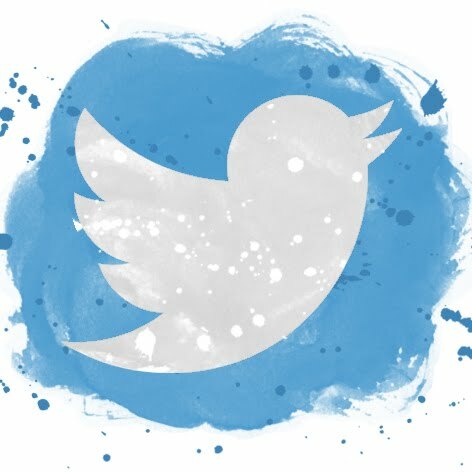 This week Deb posted a series of questions for for followers to answer. The idea is that we all get to know each other a little bit better. 1. Are you an Urban, Suburban, or Rural living fan? Definitely not suburban. 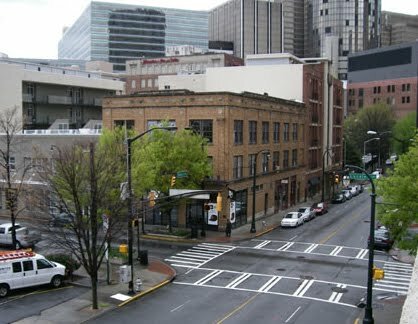 My husband and I have lived right smack in the middle of downtown Atlanta for 20 years and we love it. While I miss having a place to garden I love being able to walk almost everywhere, sometimes a week goes by and I realize that I haven't been in the car once. Ideally a city place with a big patio or private courtyard would be perfect. 2. Do any of the above types of places inspire the creative side of you? Urban inspires me visually but sometimes causes brain overload. Rural clears my brain so that clear ideas can pop in. 3. If you could live anywhere (jobs and money not a factor), where would you live? Right off the top of my head I would say Florence, Italy. The food, the art, the people, talk about inspiration! If it was here in the states the selection would be more difficult. Weather would be a big factor. Since we've had several snow storms and Florida is out of the question I guess that leaves California. When it comes down to it, I could live just about anywhere and be inspired by anything. I think it's in my genetic make-up. All I need is a good fabric store, art supplies a vegetarian restaurant and a coffee shop. Oh...and reliable internet access. Now it's your turn to participate in the social. Tell them Paula sent you! Here's a link to the original post. 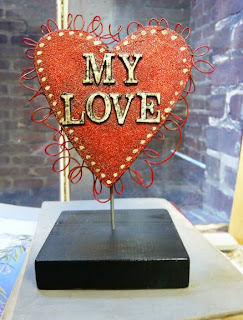 For more on the Etsy Homefront Artistry Team go here. Disclaimer: I am not a military spouse-I'm just a HUGE fan of these gals! I can almost pinpoint the moment when my love of buttons began. It all started with my great grandmother. She had her own little sewing/TV room and it's where my sister and I would play when we were visiting. The floor was that old linoleum that would crackle when you walked on it. There was a big red rocking chair in the corner, a sewing machine, a black and white television and a closet filled with magical things. She had coloring books, games, dolls and strings and strings of buttons. I would sit there forever looking at every button. She had a story for most of them and we would discuss our favorites-the image of this is crystal clear. When I got older we would make doll clothes and I would get to snip a special button off of the string to use on a dress or shirt. Her buttons were passed on to me and I still have them. Some of them have been used in various projects but the most special ones (and our favorites) are stored in a jar. I have added to the collection over the years but my most special favorites are still the same. The favorites. The blue ones are hand painted glass and are about 1/4" The photo doesn't do the pinkish one justice. It's about 100 different colors at a time. A shoebox lid of assorted white buttons. My old sewing box from junior high. It contains my grandmother's (I guess it's a family obsession) buttons. A mix of vintage and new reds. A box of vintage shell buttons. 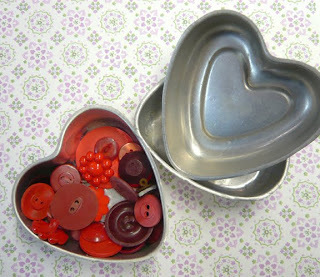 Vintage metal buttons. I love the crown Nepaul ones. My favorite green buttons-I am finding it difficult to use these on something. I love some of the cards that the buttons came on. At 3" I think this is the largest one in the collection. 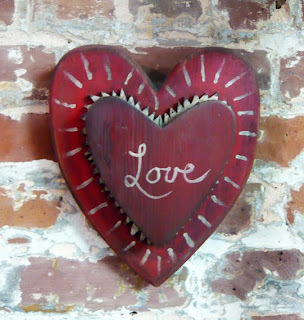 As it is Valentine's Day, I thought I would post photos of a few of my favorite heart shaped/love related things. Happy Valentine's Day to you all! 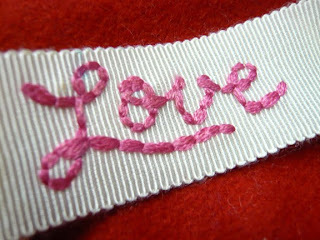 I stitched this tag last night. It's for one of the projects that I've been working on. Can't wait to show the finished piece. 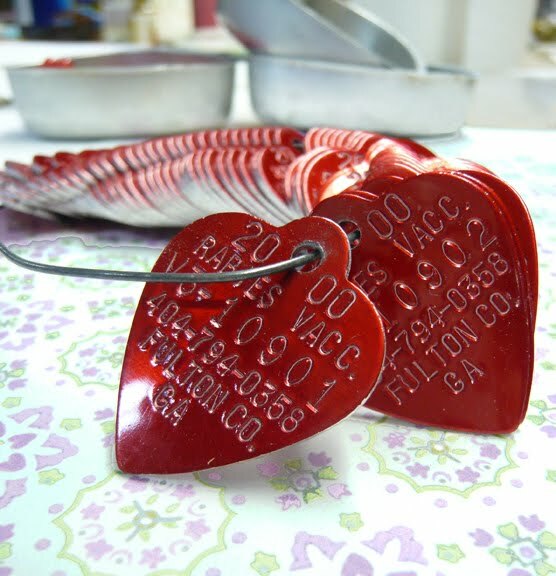 Vintage heart shaped jello molds and red buttons. My husband Tom gave me about a zillion of these after we got married. I refer to them as my wedding gift from him. 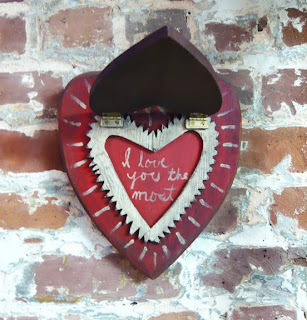 A home-made Valentine from Tom (2009). Another home-made Valentine from Tom (1992). Lucky me, right? 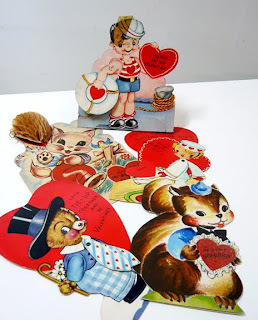 And just for good measure, some vintage articulated Valentine's. Have a sweet, lovely, mushy special day everyone! This is a post for those of you who are Valentine's Day challenged. These images are from my stash of 1950's and 60's scrapbooks; one of which is dedicated to the month of February. Hopefully something here will spark an idea as to how to properly show your loved ones that you care. handmade gifts are nice too. What says "I love you" more than a corn or lime bean gelatin salad? I have to say that I'm intrigued by the "Moss Rose Cake". It's covered in chopped pistachios and has an almond cream filling-yum. Well I hope this gave you some ideas for the 14th. As for me, I won't be baking or entertaining but I will be taking my husband to a burlesque show- he's a lucky guy!